THE NOTES AND SKETCHES of which the present small volume consists have not been written upon any systematic plan. The nucleus of the whole was a paper read several years ago before an audience of decent country folks, who, it was thought, might listen with some interest to matters connected with the social and industrial life of those who had preceded them, and lived under conditions as to occupation and the daily round of duty, corresponding as nearly as might be with their own. The object in view then met with at least the amount of success that had been expected; and the paper with variations—or rather, perhaps, part of it with additions—was, at intervals, repeated to other similar audiences. And thus the essay grew in bulk. The style is admittedly not altogether that which would have been adopted had publication been in view at the outset, the paper having been shaped mainly to suit the original purpose for which the materials were gathered. The sources ci information were various, and are generally indicated in the text. Of the books chiefly consulted a list has been in the Appendix (1) in preference to an excessive multiplication of foot notes. And it occasionally happens that a statement made, or an opinion expressed, is the result of a comparison of two or more authorities rather than the unqualified averment of a single individual. 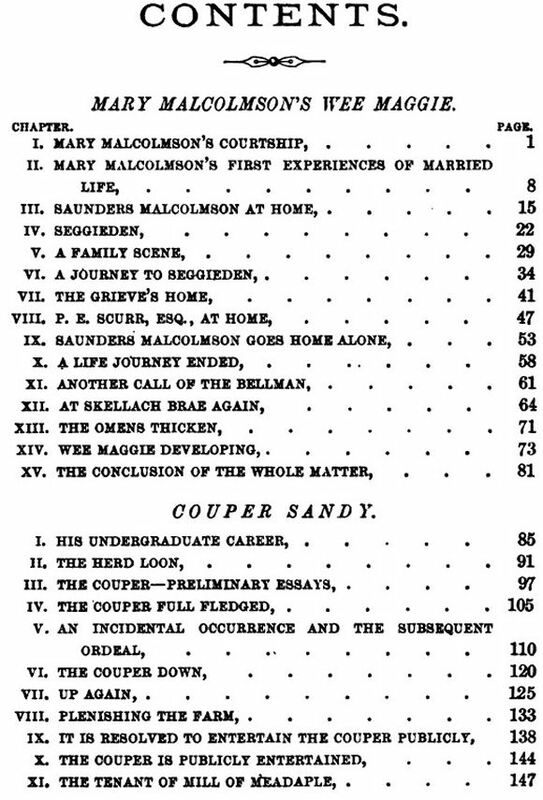 In acknowledging his obligations to several friends who have supplied information on particular points, the author feels it right to say that he has been specially indebted to Mr. Alexander Cruickshank, M.A., whose unwearied industry in the collection of facts and statistics is not more marked than his unselfish readiness to make his stores of knowledge available to others. 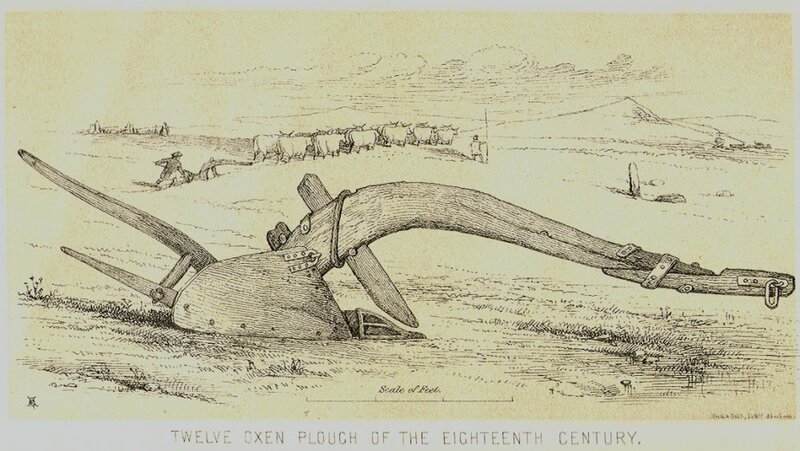 The sketch of a twelve oxen plough, which forms the frontispiece, is from the skilful and accurate pencil of Mr. Andrew Gibb, F.S.A., Scot. 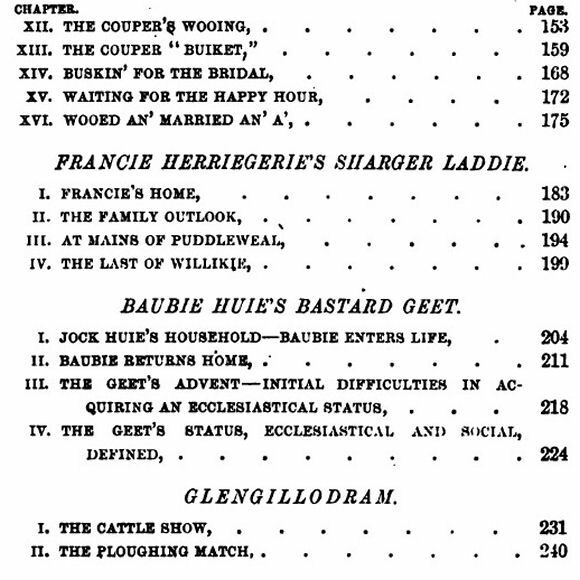 ; and was taken from the specimen in Marischal College Buildings mentioned at page 33. The beam remained entire at date of drawing; the stilts, &c., had to be somewhat helped out from the parts of them still extant, and a certain measure of traditional knowledge. And as the plough is drawn to scale, readers interested in such matters, and who care to do so, will be able to compare its size and the proportion of parts with those of the improved plough of the present time. 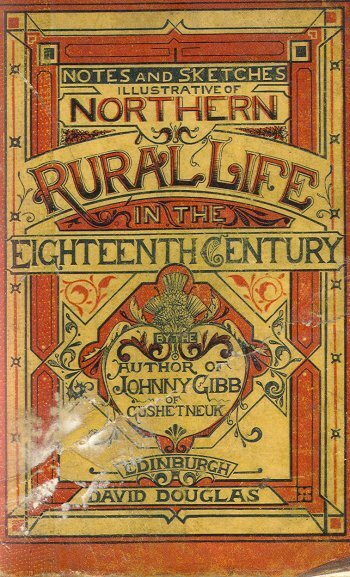 Electric Scotland Note: There is an identical book under a different title and author "Notes and Sketches illustrative of Rural Life in the 18th Century" By Wm. Alexander (1877) and so far we are unable to identify which is the correct author. William was born on the 12th of June, 1826 in Chapel of Garioch, Aberdeenshire to James Alexander [Farmer] of Chapel of Garioch and Ann Wilson of Rayn, Aberdeen, and he was christened in Chapel of Garioch on the 18th of June, 1826. By April 1841, James and Ann were farming at Damhead and had nine children there, Margaret 15, William 14, George 13, James Jnr., 11, Isabella, 8, Helen, 6, Leslie, 4, Jane, 2, and Henry, 1 Month. In April 1851, the household of James [A Farmer Of 50 Acres Employing 4 Labourers] and Ann, at Damhead comprised only William, James Jnr., Isabella, Helen, Jane, Henry, and Mary aged 2. William at this point was working with his father on the farm. By April 1861, William, now 34 years old, was living in 7 Charlotte Street, Aberdeen, and he was employed as a Newspaper Reporter. Living with him there was his sister Helen. William aged 40 in 1867, and by then a Sub-Editor of the Aberdeen Free Press, married Anne Allan of Aberdeen (aged 33) daughter of Shipmaster Robert Allan, at Silver Hills, Stocket Street, Lower Aberdeen on the 22nd of May of that year. 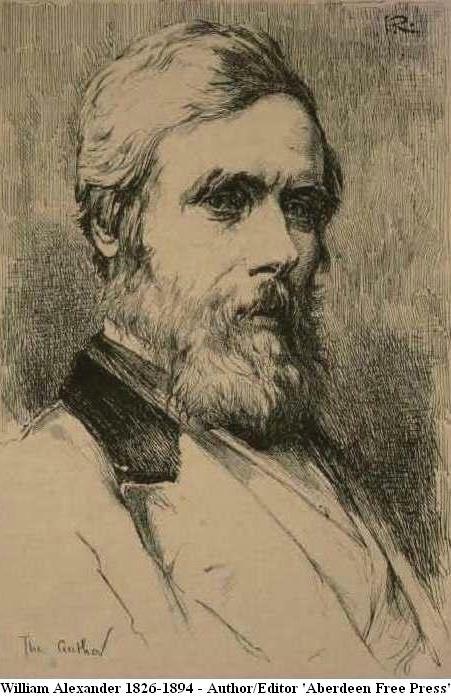 By April 1871, William had become the Editor of the Free Press and was living with his wife Anne, and a servant Jessie Milne, at 19 Watson Street in Old Machar, Aberdeen. In 1881, without any offspring, they lived with a servant Isabella Gray in 3 Belvidere Street, Old Machar. By this time William, in addition to his Editorial responsibilities, had published three books. 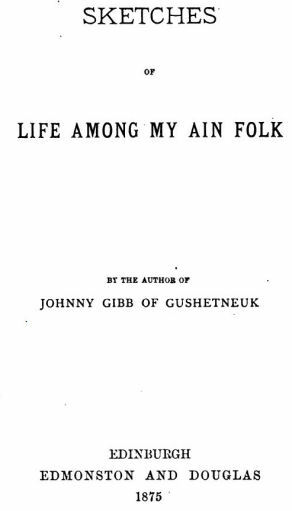 His first, ‘Johnny Gibb of Gushetneuk’ ran to seventeen impressions; and he had followed this success with two smaller books – ‘Notes And Sketches Of Northern Rural Life’ and ‘Sketches of Life Among My Ain Folk’. In the April 1891 Census, then 64 years of age, we find him still in 3 Belvidere Street with Anne, but with his employment listed as ‘Journalist’. Perhaps he had retired and was ‘free-lancing’? His death on the 19th of February, 1894 from pneumonia in 3 Belvidere Street was registered by his brother Henry Alexander of 10 Westfield Terrace, Aberdeen. William was survived by his widow, Anne. 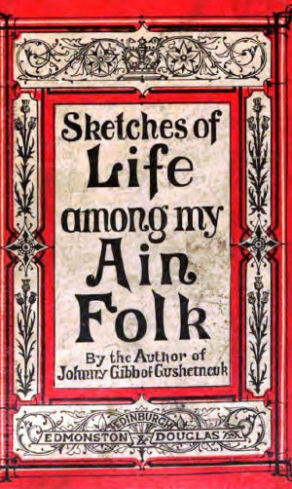 The Sketches that compose this small volume profess to be nothing more than slight studies, in situ, so to speak, of certain phases of local life, and the "humours" through which that life finds expression. The characters are, of course, ideal in one sense (or, say typical), and in another as truly realistic and close to the actual life as the writer could succeed in making them. Possibly some will hold the little book to be lacking in loftiness of sentiment, and refinement in the dramatis personae; but. we must picture life as we know it. And, after all, who is it that has not, oftener than he wished, in his experience found loftiness of general sentiment and a profession of high principles set in the fore front, where the veritable life was guided by considerations as mean and sordid as well might be. Better, at any rate, have things in their real and undisguised forms then; and this merit we claim. Of the various principal figures introduced we shall only say that we have known them one and all sufficiently well to be able to present them acting in consistency with themselves. The two short sketches that come last were published in All the Year Round about five years ago, and are now reprinted by permission of Charles Dickens, Esq.